I’ve always planned on a bell sleeve, but I wanted something more than just a widening sleeve at the edge. 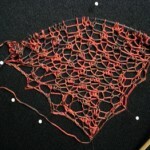 After trying a few different edges, I decided on the lacey one you see here. 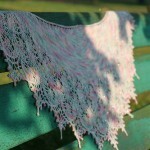 It’s a messy lace, in a good way. I’ve been dying to use beads so I picked up a few varieties this weekend. 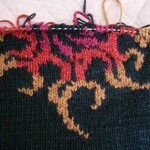 I crocheted a couple of edges on the lace, and I’m leaning toward option B (on the right). They’ve both similar but I like B because it’s sturdier. 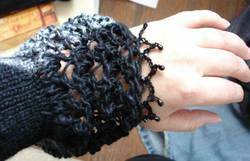 I think it’ll be fun to wear with the weight of the beads and the strength of the crochet. There’s this nagging part of me that wonders if it’s too much. I’m keeping things as is for now, and I’ll see what I think after the second sleeve is done. 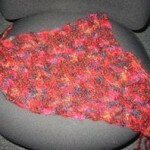 It’s so easy to rip crochet that I’m not too worried about it if I do want to remove it. The way I figure it, I have about a week left to finish. If I can finish the cap this week I should be safe. 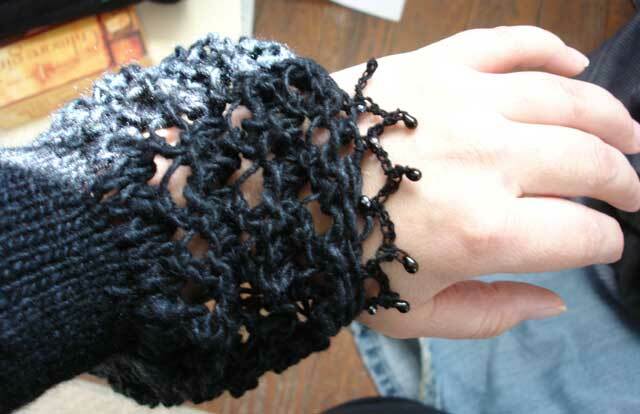 That’ll leave the arm, the crocheted edging, and about 50 more ends to weave in over the weekend. I like option B best too. Gorgeous bell sleeve. Not to much, but it is gorgeous. I’m loving the lace (and option B). I like option B too. The sleeve looks so neat! I think it’ll go well with the design on the chest. I love both of the but B is my preference. Beautiful work! 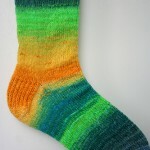 Start picking out your sock yarn, girl! i like B best! i think it fits the sweater better!!! Love, love these sleeves. I like option B too. B for me too. CAN’T WAIT to see the finished product! Well, what can I say? These are the absolute perfect bell sleeves, both of them actually – they’re exactly what I was looking for for ages but never seemed to find. I’m totally stunned by yours – and yep, I’d go for version B as well! I like B better, too! Lovely. 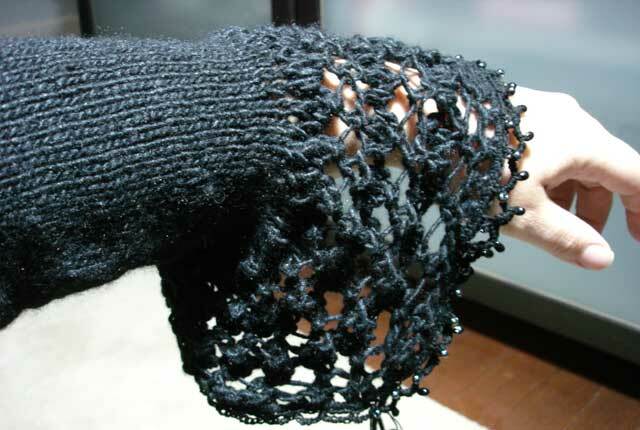 I love crochet edgings, they really give a personality to knitwear. Just chiming in for option B as well. It was hard though. They’re both so beautiful. The second one looks like it might be better just because it would hang down less and be less annoying. Both are really cool though. Will we see you tonight? Too much? Not at *all*. Its gorgeous (and I vote for B also, if voting is allowed). This sweater just keeps getting better and better!